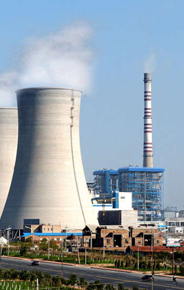 Environment preservation is one of the major area of concern, we are facing in the world.Environmental impact has become an increasing concern for companies, as local and global environmental issues bring increasingly restrictive rules affecting air, water and ground pollution. Therefore in today’s business environment, consumers are very particular about clear signs where the environmental processes and impact of a business are effectively managed. However, more than presenting such elements as a part of your corporate management system, it is highly required to make a clear demonstration that they can be continually improved on.Aneffective management of environmental issues contributes positively to economic gain and increases the competitiveness of the company, caring for the environment improves the image of the company when it fulfill its environmental duties. In accordance to constantly evolving global awareness, every manufacturer and service provider are forced to implement suitable management systems to their supply chains to ensure their environmental friendliness. 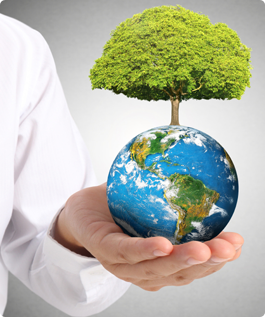 In order to prevent environmental degradation,various tools and techniques are being used of which, ISO 14001 the Environmental Management System (EMS) is one of the most effective approach towards it. The ISO 14001 was developed primarily to assist companies with a framework for better management control that can result in reducing their environmental impacts. With the ISO 14001, companies can merge environmental programs into one cohesive system to efficiently manage all environmental activities. In addition to improvements in performance, organizations can reap a number of economic benefits including higher conformance with legislative and regulatory requirements by adopting the ISO standard. ISO 14001 certification provides organizations with a competitive advantage by demonstrating to their customers that their environmental processes and impacts are effectively managed, continually improving, and part of the corporate management system. In many terms, ISO 14000 is similar to ISO 9000 quality management where both pertain to the process of how a product is produced, rather than to the product itself. This indeed enable Organizations that align their commercial objectives with global ecological concerns stand to gain a substantial competitive advantage. Therefore, compliance to such a standard ranks high on the agenda of thousands of organizations worldwide that place importance on their environmental impact. The mandate will still require the basic principles and existing requirements of ISO 14001:2015 in addition to improving environmentally safe outputs as part of the core management system. The essential elements for ISO 14001 environmental management systems certification are that, it must commit to continual improvement and to comply with applicable regulations and legislation, the elements which will drive your organisation to continually develop your environmental performance and achieve greater recognition in the marketplace in which you operate.Both ISO 9001:2015 and ISO 14001:2015 share a common structure, terminology and framework which makes the standard very complimentary enabling an easy and seamless integration organized as a "single system" rather than two separate stand-alone systems which many organizations holding both certifications would have operated. 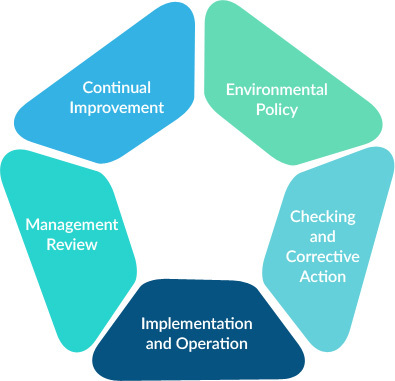 The major underpinning of the ISO 14001environmental management system is the ‘Plan-Do- Check-Act’ cycle which is in common with other management system standards. Gap assessment is one factor which is highly recommended to identify all possible rudiments of business operations that influences with the Environmental Aspects. It provides the organization with a clear definition of management principles. Which helps to plan and establish environmental goals and targets, which can be built on to their policy. It is a useful tool for an organization to step up from just maintaining regulatory compliance to an organization with improved productivity and enhanced competitive advantage. In this phase, the devised principles and processes are to be implemented by the organization to make sure that are in-line with their policy. In order to do so, it is necessary to implement resources and foster better assurance and process over the elements such as credentials control, knowledge transfer to employees, readiness and responsive during emergency situations. 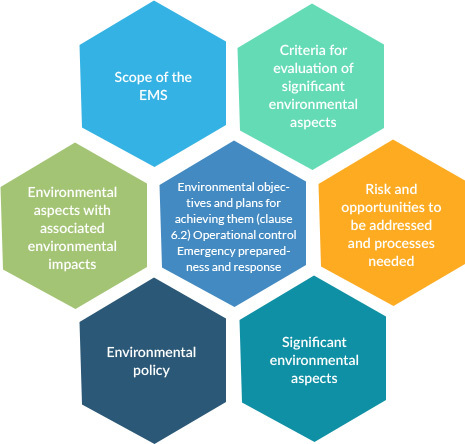 Above all, an effective and a vigorous part of this phase is to establish a collative participation and communication across all levels of the organizational stack up to implement an effective EMS in place. Monitoring and compliance observance on a periodic basis is another important factor once the process has been implemented. It is to make sure that the environmental targets and objectives, at an organizational level, are being met. 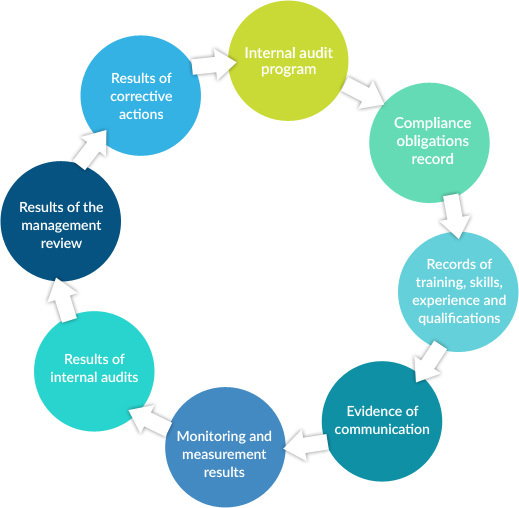 Internal audits are also a part of this phase which is conducted to make sure that the EMS is in-line with the compliance and requirements and are being adhered to. The ISO 14001 standard is highly flexible allowing it to be applied to the complete range of business sectors, scopes, and activities, which is one of its great benefits. 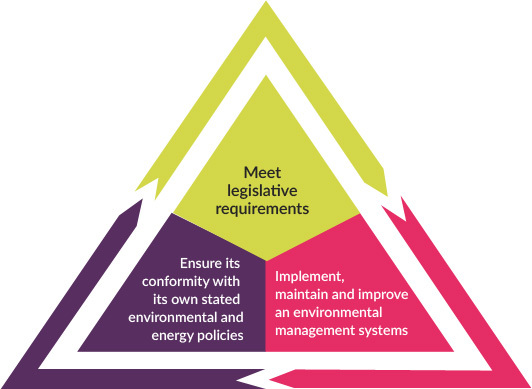 Itprovides a framework through which an organisation can deliver environmental performance improvement in line with its environmental policy commitments. Similar in structure to the ISO 9000 quality management system standard, ISO 14001 outlines key requirements companies should comply with in order to operate in an environmentally responsible manner. 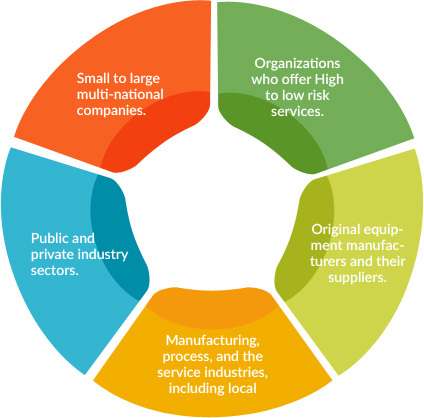 ISO 14001 is applicable to all types and sizes of manufacturing and service operations throughout the world where it specifies environmental requirements that the organization identifies as those which it can control and influence.ISO 14001 is flexible - it is as applicable to both the small business and the multinational organization. The extent of the application depends on factors like the environmental policy of the organization, the nature of its activities, products and services, the location and the conditions in which the company functions. For simpler, small companies we offer our ISO 9001 and ISO 14001 Group Scheme – a simple low-cost approach to certification. 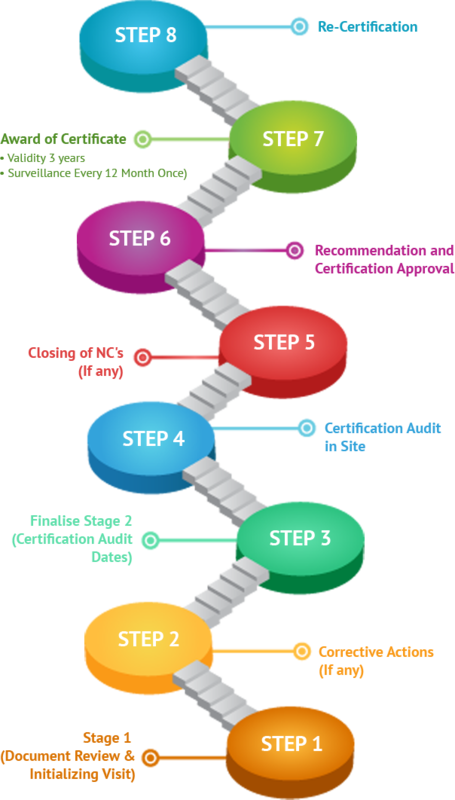 This offers the best value approach to certification for smaller companies currently available. 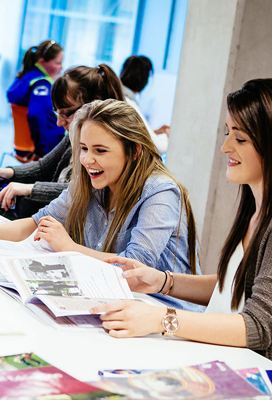 For more complex companies (multi-site, complex design processes, international trade etc.) or larger companies, we offer Training services, systems design, development and deployment, and certification. Improve your corporate image and credibility, so helping you win new customers. Improving cost control through use of energy, which also may imply a reduction in the cost of running your business. New business opportunities, as credibility from stakeholders and consumers for minimalized environmental impact, is established. Gain a competitive advantage over the environmental performance throughout the supply chain. Early identification of problems with the environment. More guarantees for the compliance with legal and other requirements. Preventing potential problems, sanctions and expenses related to the removal of potential damages caused to the environment. Once our highly competent & qualified auditors who are experts in the sector, identifies that yousatisfy the requirements of ISO 14001-2015, we TRAIBCERT a leading accredited certification body will Issue the ISO 14001-2015 certificate. TRAIBCERT, an independent third party certifying body, believe that an audit process should be about good communication between the Client, Auditee, and the Auditor. Our approach to registration ensures that the auditor is at your facility for all of the important stages of the audit process. TRAIBCERT’s services are designed to help you achieve an Accredited ISO 14001 certification as well as maintain it in the way that best meets your needs, and to deliver tangible business benefits for your organisation.Through our straightforward and efficient approach towards the development of effective Management Systems, We bring together specialist advisers and assessors to provide you with appropriate Training and certification services to ensure that your management systems are focused on your needs and the needs of your clients by providing you with a rapid, compliant and effective route to certification. We maintain open communication with you throughout the entire process, where we welcome your feedback and discussion in an objective manner. Our proprietary certification process is designed to provide objective, value-added feedback on your business performance as not only assess how well your organization meets all these requirements; but also put forward a detailed report, illustrating the way the concern performs. 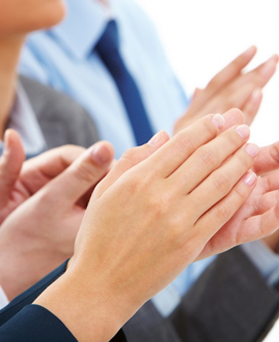 With the certificate issued from TRAIBCERT’sthe organisation is able to prove to the stake holders about the Environmental management system commitment and it is ability to meet the global standards. Our document certifies that the holder has been able to handle the environmental issues in a highly effective manner and ensure that the enterprise holding this certificate is taking necessary steps to complete environmental & social duties.